Contradiction is present everywhere. 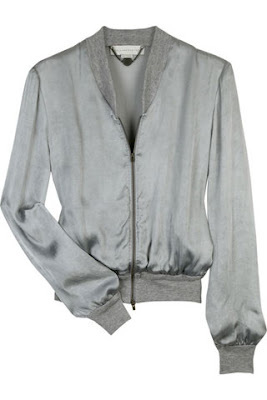 A fine reflection of it is Stella McCartney's undeniably current Cupro Bomber Jacket. Gorgeously silky yet easy to understand thanks to its simplicity, this piece represents ambivalent feelings that take form depending on who wears it and her state of mind. Is it casual or modernly elegant? That answer will vary constantly: much like your take on a glass' half-emptiness or half-fullness. The question remains: Is it gray or silver? Hey! You always come up with something sharp .I love your opinions because they provoke a more deeper level of thinking.